1 Arrange jalapenos peppers, cut-side-up, on aluminum-foil-lined jelly-roll pan. 2 Combine potatoes, 1/2 cup cheese, Hellmann's® or Best Foods® Light Mayonnaise and sour cream in medium bowl. 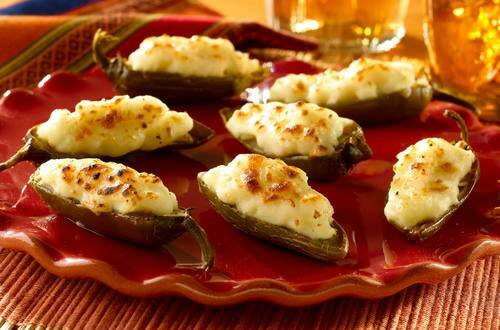 Evenly spoon into jalapenos, then sprinkle with remaining 1/2 cup cheese. Broil until golden and cheese is melted.